Tonight we tried our zucchini boats with spaghetti sauce. I found the spaghetti boats to be more flavorful than the cheeseburger boats. My kids couldn’t decide which recipe they preferred. Which recipe should you prepare? I guess whatever floats your boat! Put a stock pot full of water on the stove and bring to a boil. Meanwhile, cut the ends off the zucchini and slice lengthwise. Halve the zucchini if necessary. Add the zucchini to the boiling water and cook 10 minutes or until tender. In a skillet, brown ground beef and onions. Add spaghetti sauce and seasoning. Remove the zucchini from the water. When cool enough to handle, scoop the inside of the zucchinis into the ground beef mixture and stir well. 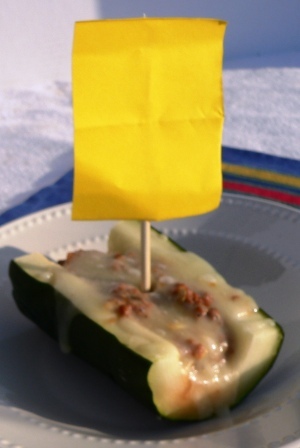 Arrange the zucchini on a baking tray and fill with ground beef mixture. Top with cheese. You may also enjoy Italian Sausage and Summer Squash Skillet and Summer Squash and Chicken Skillet.